Local Owners !!! !...We Are Here For You !!! With a list of amazing amenities that stretches as far as the mountain views, nothing beats this 3BR/3BA Pigeon Forge Tennessee cabin for an exciting family getaway. 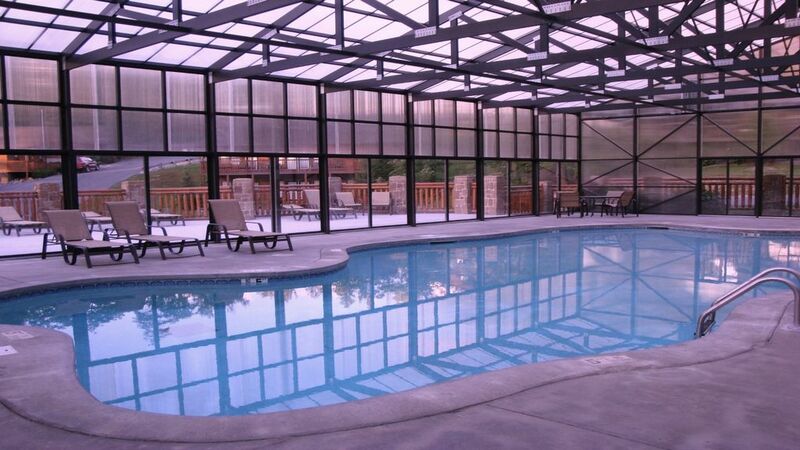 Access to an indoor heated pool, private hot tub, game room, bedside jetted tub plus FREE WIFI...the list goes on. Let your furry friends get in on the fun too—our cabin is also pet-friendly! Here you’re just one mile from thrilling Dollywood for exciting rides, shows, and attractions. The Pigeon Forge Parkway, full of restaurants, entertainment, and shopping, is just three miles away. And Gatlinburg and Great Smoky Mountains National Park are just five miles away from our central spot. Take a load off! The living room’s floor-to-ceiling wall of windows allow you to appreciate the mountain views from the comfort of the couch. Soaring ceilings and stacked stone fireplace add to the grand feel of the space and enhance the views. From quick snacks to gourmet meals, the fully-equipped kitchen has everything you need to feed your hungry crowd. Sit down to the 10-person dining room table, with the mountains as your background. No boredom here—the game room has a pool table, air hockey, and flat-screen HDTV . With three master bedrooms, one on each of the floors, everyone gets privacy and quiet. No need to bring along air mattresses – both living rooms have queen sleeper sofas for guests to lay their heads. Like your own personal honeymoon suite, steal away to the third-floor bedroom, outfitted with a romantic bedside jetted tub and private balcony. Along with plenty of sleeping space, there’s lots of getting-ready space in three full bathrooms. The bathrooms on the first and second floors come with tub and shower combinations, while the third-floor bathroom has a walk-in shower. Out on the deck, let the warm waters of the hot tub melt your stress, as the mountain stars come out above you. Grab that book you’ve been meaning to finish and settle yourself on the porch swing. When the sun goes down, the fun keeps going! Watch the Dollywood fireworks show each evening throughout the summer from both decks. You also get a front-row view of amazing sunsets throughout the year. No matter the time of year, enjoy an indoor heated pool, shared by all the homes in the secure Hidden Springs community. Other amenities to make you feel at home include ample parking, TVs in all the bedrooms, Wi-Fi , air conditioning, and washer and dryer. Guests with mobility issues will appreciate the ground-floor entry with handicap ramp and main floor bedroom and bathroom so they don’t have to tackle steps. A mile away, Dollywood is the ultimate in good, clean family fun. It boasts roller coasters, amusement rides, concerts, shows, and special events all-year round. Next door, Splash Country has thrilling water slides, a lazy river, and special kids area for the little ones. Find more exciting things to see down on the Pigeon Forge Parkway, where you can do everything from race go-karts to see a Titanic exhibit. See a show at Dixie Stampede, Comedy Barn, Smoky Mountain Opry , or Hatfield and McCoy Dinner Show. Get a thrill on the Alpine Coaster and experience the rides at The Island. Sit down to a Southern feast at , Paula Deen’s Family Kitchen, and shop-til-you drop at the Tanger Outlets. Just five miles away is Gatlinburg , with its restaurants, ice cream shops, and stores. And, of course, Great Smoky Mountain National park has hiking trails as well as the Roaring Fork Motor Trail, where you can drive your car through and enjoy the natural beauty. We have retired to BEAUTIFUL Smoky Mountain Tn...and NOW living close enough to my cabins that if you decide to spend your vacation at one of my cabins you are dealing directly with the owner..We work very hard to make sure your vacation is 100 % to your satisfaction !!!.. 3 Full Size Bathrooms. .. Step in Shower in upper bathroom! Parking for 3 vehicles in front of cabin .. No step's into cabin .. Very nice property with easy access to Dollywood. You can make it to anywhere in Pigeon Forge within 10 minutes. Easy access to the Parkway to go to Gatlinburg or the Smokies. Plenty of room to spread out. We are a big family (3 boys 6'7", 6'1", & 6'0") plus me 6'4" so it was nice to not be on top of each other. The 3 full size bathrooms were a plus as my wife could have her own bathroom and our boys were able to share 1 each. Our boys loved the pool table, arcade game, and air hockey. The only downside was some limited utensils and measuring cups. If you are going to eat a lot of meals at the cabin, you will need to run the dishwasher daily. The adults and the kids absolutely loved it. Plenty of activities and spectacular views! We had a great vacation at your cabin ! The Hot Tub was very soothing ans so relaxing ! This was the best get a way we have ever had ! The view from the deck was awesome cabin was very clean and so homey .. It was very peaceful and relaxing . We will be coming back for another visit in the very near future ..
Nice cabin, plenty of room. Beautiful view of mountains .... we enjoyed the jacuzzi.